In addition to our line of atlases & maps, we provide custom cartography services for both personal and commercial use. If you are looking for high quality cartographic content to represent your company, organization, idea, or just to display proudly on your wall, we can help make that happen. 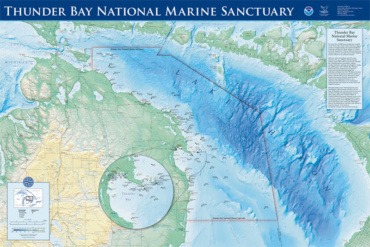 <strong>Thunder Bay National Marine Sanctuary</strong><br /> A poster made for the National Ocean and Atmospheric Administration (NOAA) to promote their national marine sanctuary. It is one of the first glimpses at the depths of Lake Huron as well as the maritime history of the regions shipwrecks. Thunder Bay specifically needed an inset map, and having a circular one almost gives the reader the feeling of looking through a telescope. 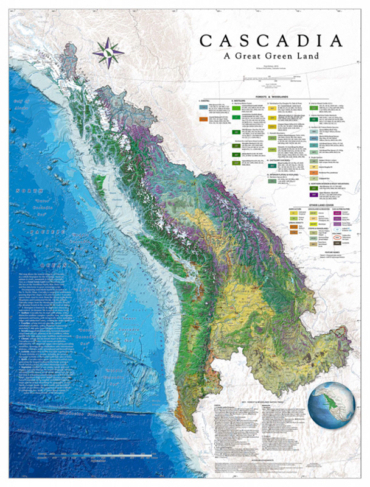 <strong>CASCADIA: A Great Green Land</strong><br />Chosen to grace the cover of the 2015 Esri Map Book, this map, by the Cascadia Institute, with cartography by Benchmark Maps, shows for the first time the natural integrity of Cascadia as a whole bioregion. Cascadia is named for the whitewaters that pour down the slopes of her mountains. Home of salmon and rivers, mountains and forests, Cascadia rises as a Great Green Land from the Northeast Pacific Rim. This layered, information-rich, award-winning map shows the distinctive character and context of the wider bioregion in several ways for the first time. <strong>Mora County</strong><br /> This map is an example how we can stitch together our Landscape Maps for a particular county. 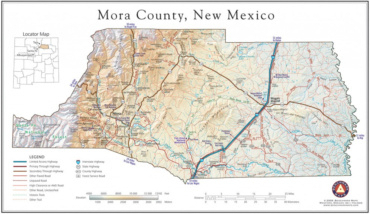 Mora County, New Mexico was in need of a good, detailed map of their county that could be printed as a wall map or used in presentations. 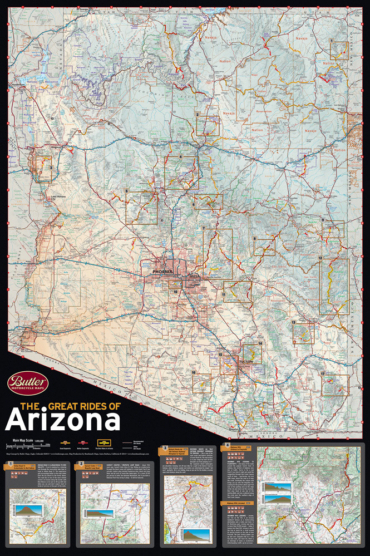 <strong>Butler Maps Arizona G1</strong><br /> Butler Maps is the go-to company for high-quality, accurate, and detailed motorcycle touring maps. They knew they wanted the best cartography available, so they came to Benchmark to leverage the award-winning cartography found in our Road & Recreation Atlases. We’ve had a great working relationship for over 6 years and continue to help expand their top-selling series of maps. <strong>United States Coast Guard – Port Angeles</strong><br /> The US Coast Guard’s Port Angeles Air Station came to Benchmark Maps because they were in need of a highly-detailed wall chart to be used for planning rescue operations. 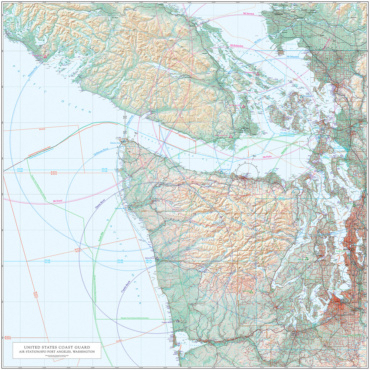 This large (56″ x 56″) chart was built from our Landscape Maps and includes navigational aids, airspace, and communication boundaries that were provided by the Coast Guard. We have been updating this chart for them on a regular basis since 2009. 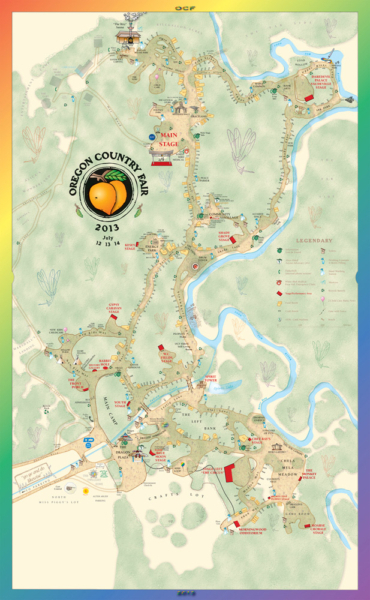 <strong>Oregon County Fair</strong><br />This whimsical map centers around one of the largest art festivals in The West, which only takes place over a few days each summer outside Eugene, Oregon. The map was mostly manually created to give the look and feel of a hand-drawn work of art. The variety of colors reflect the festive sights and sounds on the ground. Each year the fair is in flux. So keeping up with that flurry of activity and change was a challenge. 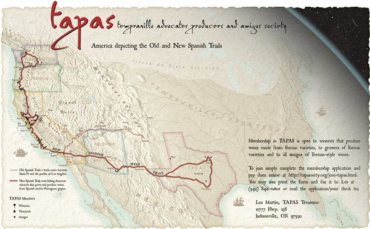 <strong>TAPAS nuevo spanish wine trail</strong><br /> This organization wanted to define and promote The Nuevo Spanish Wine Trail by reinventing the Old Spanish Wine Trail into a trail that winds near their members. This map series was to evoke the feeling of old style, hand drawn maps with the inclusion of smeared mountain shading, cartouches, and water-colored symbols. There are more detailed maps of each region found on the website. 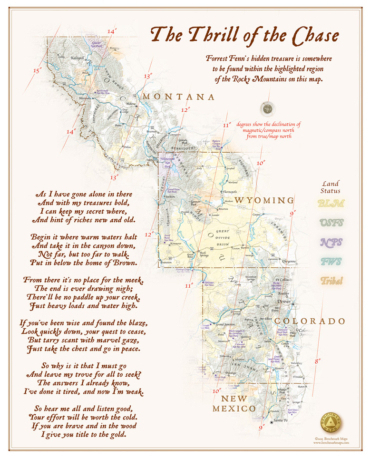 <strong>The Thrill of the Chase Collector’s Wall Map</strong><br /> The Thrill of the Chase wall map signed by Forrest Fenn was derived from our fold-out map in Forrest Fenn’s book Too Far To Walk. It highlights the searchable area for Mr. Fenn’s hidden treasure, notably shown and described in his memoirs The Thrill of the Chase. 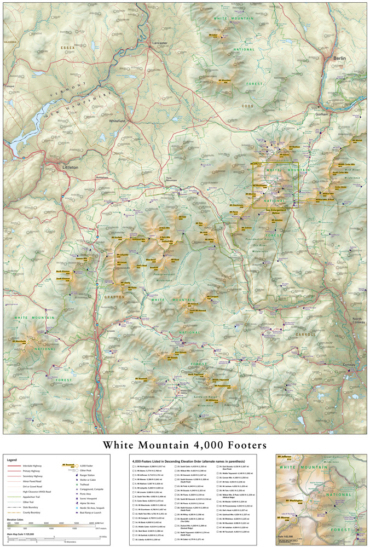 <strong>White Mountains 4,000 Footers</strong><br /> This map was made for a three-dimensional model carver who then prints it on plastic, heats it, and then forms it onto a model of the land. Once it cools, the map will be apart of a 3D terrain model as seen in the photo below. This was done with Summit Terragraphics, an innovator and leader in mass-producing beautiful and accurate 3D terrain models. <strong>Fisher International Mills</strong><br /> This map was as a promotional piece for global mills for Fisher International. Several thousand mills and their associated throughput are included on this map to create a truly data-rich map. The symbols are three dimensional spheres that float above The Earth to highlight the map’s message. The soft, natural colors help create a beautiful piece that each company should be proud to display on a wall in their workplace.